Carlsberg has launched a new cross-sector collaborative project to develop the world's first fully biodegradable wood-fibre beer bottle as part of its Carlsberg Circular Community (CCC) initiative. The Danish brewing firm has initiated a three-year project with packaging company ecoXpac and enlisted therexpertise of Innovation Fund Denmark and the Technical University of Denmark to develop a biodegradable and bio-based bottle made from sustainably-sourced wood-fibre, to be known as the 'Green Fibre Bottle'. "At Carlsberg we are firm believers in the importance of a circular economy in ensuring sustainable future growth and development on our planet," said Carlsberg's senior vice president for corporate affairs Andraea Dawson-Shepherd. "If the project comes to fruition, as we think it will, it will mark a sea-change in our options for packaging liquids, and will be another important step on our journey towards a circular, zero-waste economy." All materials used in the bottle, including the cap, will be developed using bio-based and biodegradable materials - primarily, sustainably sourced wood-fibres - allowing the bottle to be responsibly degraded and enabling Carlsberg to make cuts to its carbon footprint, 42% of which currently comes from packaging. The CCC initiative, launched in January 2014, uses the 'Cradle-to-Cradle' design framework to develop products that are optimised for recycling and reuse but still retain their value. It also sees Carlsberg working with its suppliers to encourage innovation and quality in the industry, in pursuit of zero-waste and a move towards a circular economy business model. 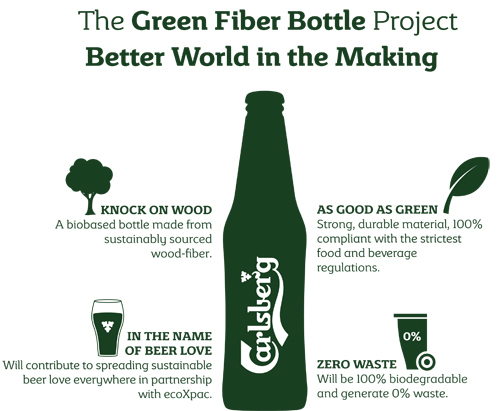 This new collaborative project on the 'Green Fibre Bottle' takes Carlsberg a step nearer its goal of having 15 partnerships within the CCC scheme by 2016. There are six founding partnerships within the scheme, inluding one with beverage can maker Rexam. The CCC initiative has already achieved cradle-to-cradle certification for Carlsberg and Somersby Cider Rexam cans in the UK in 2014 and the primary-stage cradle to cradle assessment of six different packaging products. In an exclusive interview with Edie late last year, Carlsberg admitted it was finding the process of incorporating a long-term sustainability strategy within such a large, continually-expanding company a challenge. However, the group hopes to have three innovative solutions that are cradle-to-cradle certified within the first three years of the programme. Carlsberg's senior vice-president of communications and corporate social responsibility Anne-Marie Skov said: "Around 42% of our total CO2 footprint comes from packaging - from bottles and cans to shrink-wrap. That was what inspired us to begin looking at things from a circular point of view. "We've recently acquired new breweries and new companies in china, so it's difficult to continually measure our CO2 impact, but in Western Europe our carbon footprint has gone down significantly, so the CCC scheme is already having a positive effect." Carlsberg's vice president of corporate affairs for Western Europe Charlotta Lyon will be talking during the brand new high-level conference at Sustainability Live 2015 in a session titled 'New models: the system revolutionaries'; explaining the group's approach to the circular economy and closed-loop processes. Register to attend the new Sustainability Live 2015 Conference for free here.